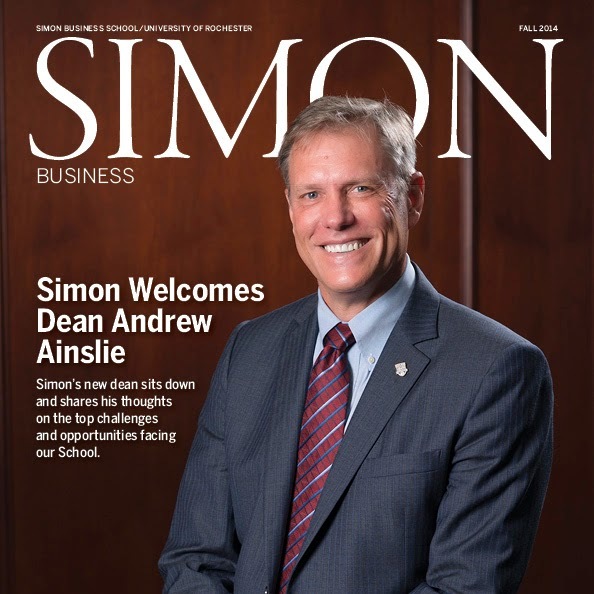 Q: Before we find out a little bit more about you and your career, perhaps you can tell us why the dean leadership role at Simon felt like the right opportunity for you. AA: I had been running the MBA program at Anderson, which was really one of the most enjoyable things I’ve done in my career. But there comes a point where you feel like it’s time to take that next step. I had been looking at a few opportunities with other business schools, but Rochester really stood out. That’s because the Simon School has a long tradition that is similar to the schools where I have spent most of my career, either as a PhD student or as a faculty member. Simon has many ties and commonalities with the University of Chicago and UCLA. So it felt like I was staying academically in the same milieu that I’ve been in for my entire academic career, and that was really important to me. Rochester also has the same high standards in terms of its research and mission. It has always been a very quantitative school with an economic approach to the study of business problems, which also ties with my own academic background. So this really did feel like an incredible opportunity. I am truly honored that I have been chosen for this position. Q: Speaking of opportunities, can you speak to some of the top opportunities for US business schools, and perhaps some of the biggest challenges they face? AA: The opportunities and challenges are essentially the same set of issues! Business is changing fast, and interestingly enough, moving in the direction that academics have been going for many years. That direction is the analysis of huge amounts of data to better understand patterns in consumption and the movements of goods, and what motivates and drives those patterns. This affects many disciplines, including marketing and operations as just two examples. Of course, finance has understood and analyzed data very rigorously for a long time, but even in finance, the sheer quantity of data has increased over the last few years. That creates both an opportunity and a challenge for business schools to impart that knowledge to MBA students. It also happens to be an area where we at the Simon School are particularly well positioned. We have outstanding faculty members in those areas who have been creating both great research and new classroom content to help businesses cope with the data deluge. The other area that presents both an opportunity and a challenge is in understanding how to better incorporate technology in the classroom, be it virtual or real. There’s been a lot of talk about MOOCs—massive open online courses. Personally, I’m skeptical on just how useful most of the early implementations of MOOCs are to people interested in improving their skillset—and the statistics show that many of the individuals participating in MOOCs get halfway through the first lesson, or maybe the second video, and then just give up. Q: That seems to go against current opinion. Why is that? AA: I think it’s important to understand student incentives. It’s naïve to believe that the only reason people go to a university is purely to learn. One of the biggest values that business schools offer is the opportunity to network. Networking provides each student an opportunity to interact with peers who are just as bright, if not brighter, than they are, with experiences both similar and different from their own. This provides a richness that can never be replicated by stand-alone videos or, for that matter, old-fashioned textbooks. It also provides an opportunity to interact directly with faculty, and a structured way to go out and look for job opportunities in the marketplace. But possibly the most important problem with MOOCs is that a degree from a good business school offers you entrance to a relatively small club. None of these are offered by online or MOOC classes, unless those classes are very carefully structured. Our challenge is to find methods that deliver content in new ways, while not walking away from this other complex set of benefits that people get out of an MBA or a master’s degree in business. 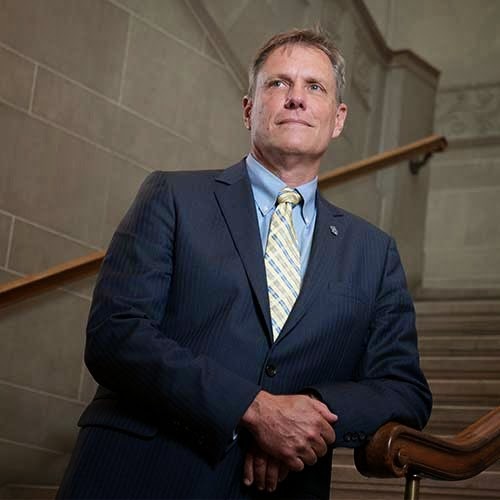 Dean Ainslie discusses the top issues facing business schools. Q: MOOCs may not be the answer, but are there aspects of their technology that offer opportunities within an on-campus setting? AA: Certainly. One of the faculty members at UCLA, Carla Hayn, developed a very successful hybrid program where students spent 50 percent of their time in the classroom in fairly intense blocks, and 50 percent of their time learning online at home. The hybrid program really does offer the best of both for people whose jobs don’t allow them to be on campus regularly in the evening or over the weekend. A similar model is being implemented at Simon with our Executive MBA program; it also offers the best of both worlds. But I think it’s important to move slowly and to be cautious. Some schools have gone into this a little too fast, and it’s not clear that what they’ve put together offers sufficient value to the students taking courses in programs that veer too far over to a pure online delivery. I think it’s important to get it right, and I think it’s also important to do it in a way that doesn’t use students as guinea pigs, but immediately gives them effective tools for learning and for succeeding in their careers. Q: We often hear about Simon’s data-driven approach. Can you speak to what that means to the future direction of the School? AA: That was one of the strongest things that attracted me to Simon. We’re uniquely positioned as a business school. We believe strongly in the value of economics and statistics and the analysis of all business problems. That arguably leaves you with a bit of a hole in terms of what we might be able to offer our students around such areas as behavioral decision theory, which is sort of an interface between economics and psychology. However, one of the first things that every business school teaches in a marketing class is the importance of differentiation, yet there is actually remarkably little differentiation between the offerings of most business schools. There are at least two advantages to being differentiated: First, this allows us to spend more time on giving our students a deeper understanding of those economic and analytic tools, and second, it allows us to offer a product that will attract that set of students who value our analytic bias. In turn, we can then put them in front of the set of recruiters that are most interested in candidates with a great analytic skillset. I think our alumni are appreciative of the type of education they received because of Simon’s differentiation. There’s a place in the marketplace for our well-differentiated product, and I don’t think we should change that. Q: How does Simon’s quantitative approach compare to UCLA? AA: UCLA is fairly quantitative in its approach. They have strong finance, marketing, operations, and economics groups, but they also have a very strong behavioral decision theory group. So UCLA is more conventional in their approach. Q: If we think about the behavioral aspect of business education, and the fact that having more quantitative education is better in the long run, do you think that extends to identifying the right prospective students? AA: I think that’s a really important point. I also think some of those behavioral aspects are difficult to teach. People often refer to this as emotional intelligence, or EQ. One of the things we did at UCLA was try to move away from picking candidates largely on their quantitative skills and to balance that with looking for candidates with high EQ by focusing on their interviews. At the Simon School, we can balance the quantitative bias of our program by bringing in the right people who already have some of the more intangible skills, such as working well in groups and with others. Q: The search committee cited as one of your strengths your attention to the research mission of the School and your farsighted approach to the challenges facing all MBA programs. What makes those a priority for you? AA: The way that one has to think about this is that it’s a matter of differentiating between long-term goals and short-term goals—and it’s also a matter of balancing between the broader goals of our community and our school’s goals. The balance that we’re trying to achieve is between ensuring that we do well by our students in the short term, but also by adding to a deeper understanding of how businesses work in the long run, ensuring that we add to our knowledge base on an ongoing basis. If business schools veer too far over to only investing in the teaching mission and underinvesting in the research mission, society as a whole will be worse off, and in the long run, we will produce graduates less able to contribute new insights to the companies that they join. More and more, the way eBay, Amazon, and Google run their businesses is based on a deep understanding of economics—and much of that knowledge doesn’t come from within those companies. They either hire people with extended research careers or they hire people who have read the literature and understand what that research is about. If business schools start downplaying the role of research, everybody will get hurt in the long run, and business itself will be negatively affected. Q: Does the slower pace of academic research always fit into the rapidly changing business environment? AA: Well, that’s changing quite fast. The typical time to get a paper from the initial idea all the way through the review process to being in print is probably around three years. And for a business, that can seem like an eternity. But there is an emerging approach where papers come directly out of current interactions that faculty have with companies facing challenging problems. The researchers interacting with these companies initially help them develop short-term tools and methodologies, but they walk away with the data that they’ve collected and invest a considerable amount of time developing a deeper, more generalizable understanding of the issues faced by that company. This provides companies with the rapid turnaround they need, while also leaving the researcher with some great data to develop deeper insights in the longer timeframe required to produce a more generalizable understanding of a complex problem. Q: Your own background is truly international, so how does that inform how you approach your understanding of the world of business? AA: It absolutely affects my managerial approach to running a business school. Our students come from every corner of the globe, and we increasingly place them around the world. More and more, universities have to make sure they do a good job of preparing graduates for an international career. However, at the same time, I frequently find myself questioning just how different the nature of business really is, as one moves from one country to another. For example, does a Chilean wine producer really face a very different set of problems from those of an American wine producer? Is the Chilean situation different from the American situation? If there are differences, are those differences something where students need to be standing in Chile to understand them, or is that something that we can explain in the classroom here at home? It’s important for us to make sure we prepare students so they can understand the types of business problems they’re likely to encounter in other parts of the world, but it’s also important not to go too far in the direction of what sometimes seems more like tourism than real pedagogy that some business schools have embraced. One of the advantages that we have on that side is that we have a very international student body. That means during their time here they will be learning from their peers about how business is done in different parts of the world, and that’s very important. One of the most important aspects of the learning that you get in a graduate-level program is not from professors, but from your interaction with your peers in the classroom. Q: Recently, Simon Business School launched its Toughen up.® image campaign. What are your thoughts on that message? AA: I’ve actually spoken to quite a few current students about the Toughen up campaign, and I’ve heard both positive and negative reactions. Alumni particularly seem to love the Toughen up campaign. It really does speak to the transformation that occurred during their time at Simon—developing a fantastic new set of analytic tools so they were able to enter the world of business better prepared and better able to handle the problems that were coming at them. And that is at the heart of what we mean by Toughen up. Some of the negative comments I’ve heard is that it feels as though we’re talking about some sort of a boot-camp, drill-sergeant approach to business, and that’s absolutely not what the Toughen up campaign is about. Toughen up is about intellectually challenging students and giving them a rigorous set of analytic tools with which they can better face the business problems that they’re going to encounter for the rest of their careers. What’s going to be important for us over the next couple of years is making sure that we effectively communicate to everybody exactly what we mean by Toughen up. We don’t mean that you’re going to be able to do 100 pushups a minute, but we do mean that in some sense, intellectually you’re going to be able to do the same thing. You’re going to be able to listen to a business problem and immediately say to yourself, What’s the right framework to solve this problem? This can allow you to reach a solution quicker than somebody who hasn’t been through two years at Simon. That’s what Toughen up means to me. of Chicago Booth School of Business in 1998. Q: Last question. What have you taken with you from your previous positions and brought to Simon? Are there successes you have experienced that you would like to apply here? AA: During the last four years at Anderson, my task was to strengthen our MBA program in every possible way. It would have been easy when I looked at that task four years ago to say, “I simply want to get an immediate bump in the rankings.” That was not the approach we took. Over the last four years at UCLA, we rebuilt the MBA program from the bottom up in ways that did not have an initial impact on our rankings. In fact, I believe Anderson will only start to see the impact on the rankings in the next two to three years. However, when I left, there was a genuine sense that we were on the right track. We had a level of satisfaction among the students that we hadn’t seen in a long time. Our number of applications was up over 60 percent from when I started. Our GMAT score jumped about five points in the last year I was there. Our percentage of minority students in the program more than doubled. So what we were beginning to do is create a group of students that was better in every possible way, and that took four years to achieve. That’s the point where I knew that Anderson was going to start moving up in the rankings. That’s the sort of approach I want to take at Simon. One of the things I would ask everybody to do at Simon is to be a little patient. Quick fixes to problems or issues often leave you with a hangover in the long run. I feel it’s really important over the next few years that we be very considered and very measured in our approach to every challenge that we face, and that we put in place steps that will ensure not that we get a little bump tomorrow in some measurement, but that we place ourselves strategically in a situation that’s going to benefit us for years and decades to come.